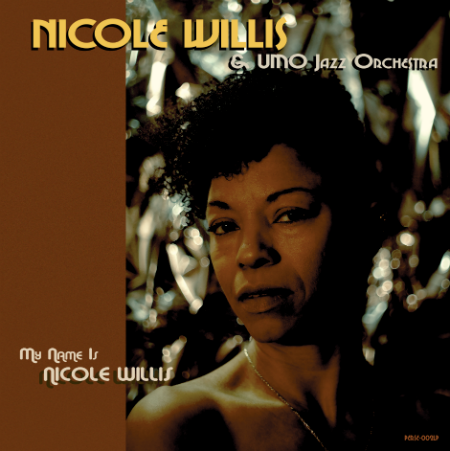 Nicole Willis, known for her collaborations with The Soul Investigators & Jimi Tenor, presents “My Name Is Nicole Willis”, an album that includes some of the tracks she composed with the former as well as originals composed specifically for a fresh collaboration with UMO Jazz Orchestra. Miss Willis entirely produced the album, while multi-faceted artist and musician Jimi Tenor has penned all arrangements for the big band and their talented rhythm section. Pete Toikkanen who is a mega-talent guitarist from The Soul Investigators, along with both Jimi and Ms. Willis, composed those original tracks that highlight their alternative influences. Indie god & personal hero of Ms Willis, Ian Svenonius introduces her on the first track and wraps up the LP on the final. Ms Willis delves into her Northern Soul anthems with “One In A Million”, “Together We Climb” and “Break Free (Shake A Tailfeather)” and with the never released “(Everybody) Do The Watusi”. For their part UMO Jazz Orchestra add extra horn dynamic and Tenor’s arrangements shine throughout, as they have on The Soul Investigators’ records. Pete Toikkanen, whose unique style has been a defining asset of the group, gives the UMO Jazz Orchestra a rawness in treatment that they have never quite exhibited before. The mixes flatter all involved and are full-bodied and rich. “My Name Is Nicole Willis” is a statement of intent and self-determination. Miss Nicole Willis won’t be denied, and the music world better be prepared!